태고사 법당 바로 옆에 위치한 원증국사의 탑비이다. 원증국사(1301∼1382)는 고려 후기의 승려로 13세에 출가하여 회암사의 광지선사에세서 가르침을 받았으며, 이후 여러 사찰을 다니면서 배움에 전념하였다. 46세 때에는 중국에까지 다녀왔는데 이후 다시 중국에 갔을 때에는 순제(順帝)가 그 소식을 듣고 법의를 하사하였다 한다. 공민왕의 스승이 되기도 하였으나 곧 소설사로 들어가 지내었고, 우왕 8년(1382)에 이 절에서 입적하였다. 비는 거북받침돌 위로 비몸을 세우고 머릿돌을 얹은 모습이다. 거북받침돌의 머리는 용의 머리를 하고 있으며, 등에는 길쭉한 육각무늬를 채워두었다. 머릿돌에는 구름과 용의 무늬가 희미하게 새겨져 있다. 고려 우왕 11년(1385)에 세워진 비로, 비문은 당대의 문장가 이색이 짓고, 명필 권주가 글씨를 썼다. 전체적으로 조각이 형식에 그치고 있어 퇴화된 느낌을 준다. This stele at Taegosa stands immediately next to the temple’s main sanctuary. 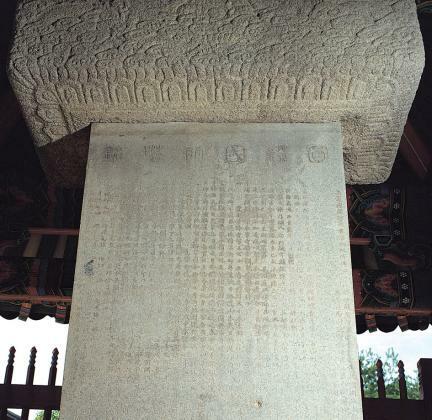 State Preceptor Wonjeung (1301-1382) was a Buddhist monk of late Goryeo. 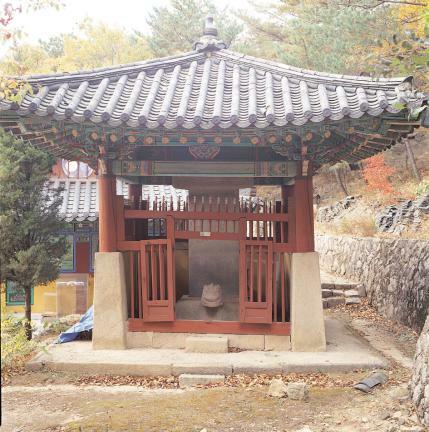 He entered the priesthood at the age of thirteen at Hwaamsa Temple, where he was mentored by Master Gwangji. Thereafter, he stayed at several other temples, continuing his Buddhist learning. When he was forty-six years of age, he traveled to China. Some years later, during his second trip to China, Emperor Shundi, who learned about his visit, is said to have given him a robe as a present. 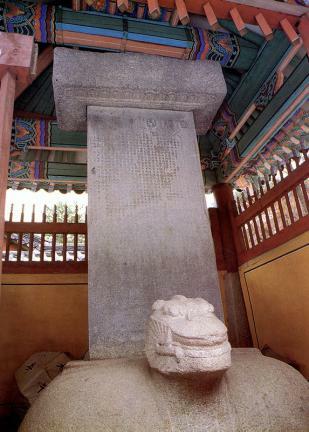 He later became King Gongmin’s mentor, but soon left the capital city for Soseolsa Temple and died there in 1382 (the 8th year of King U’s reign of Goryeo). 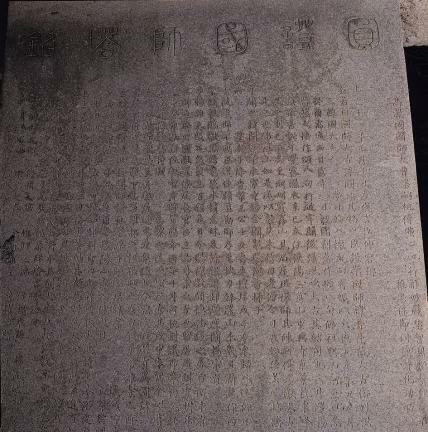 The stele is mounted on a tortoise base and has a head stone at the top. 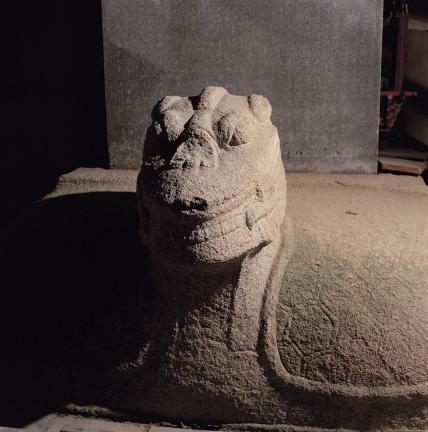 The tortoise has a dragon’s head, and the surface of its back is filled with long hexagonal patterns. 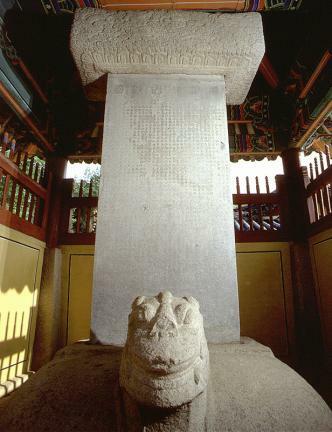 The head stone is sculpted with dragon and cloud motifs in shallow carving. 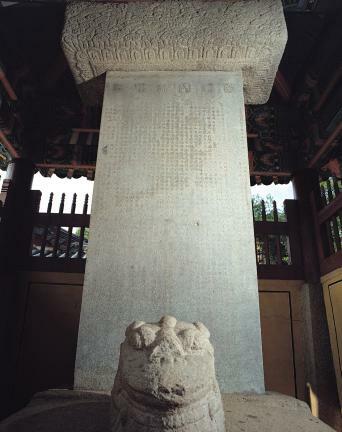 The stele was erected in 1385 (the 11th year of King U’s reign). 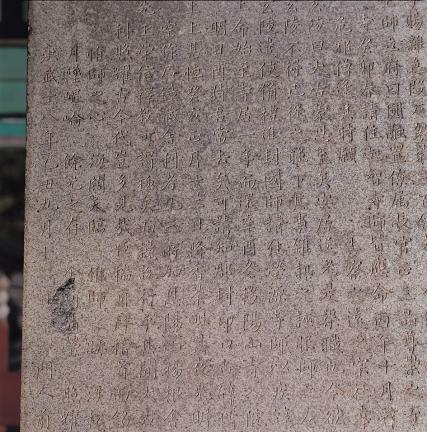 The text of the inscription was composed by Yi Saek, a renowned penman in King U’s time, and the calligraphy is by Gwon Ju, a major calligrapher of this period. The sculptural work on this stele is rather lackluster and uninspired overall.